Dig up your crystaline future, relax at the world famous Lake Quachita, make a drum and rhythmically connect to your native roots under the full moon, wire wrap a pendant, enjoy making new friends, garner insight from Adironnda, all while visiting one of the highest vibrations on the planet with like-minded people! Plan to check-out Monday morning. If you wish to arrive early please make your own arrangements. Why: To receive the gifts of the Great Mother, Gaia, and realign with Mother Earth. We still have a few spaces left. Call (417) 860-5432, or email info@adironnda.com A 50% deposit is required as soon as possible. Please note: for drum kits to arrive on time, all reservations must be made prior to April 15, 2013 Drum kits are an additional $110 includes decorative beater and 15″ one sided buffalo style drum. Includes: Breakfasts, most lunches and most dinners, wire wrapping materials, entry fees and transportation into the Crystal mines, many supplies for Power Wand (no stones included). Lodging is INCLUDED. Priced for single occupancy. For lower rate, Double Occupancy means sharing a Queen or King Bed. The condos have several bedrooms and a variety of styles. Please make your reservation early so we have more options. Lodging: First 3 (single Occupancy or 6 Double Occupancy) who register get to stay in the main lodge with Joeaux, Ann (our chef), Marilyn & of course Adironnda. Drum making. We begin this special and unique retreat by gathering together at Mountain Harbor Resort and creating our very own, hand-made native American drum. 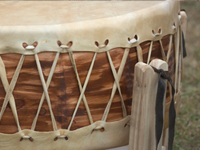 Making your own Native American drum is an amazing feat in anchoring your own energy with the rhythm of the ancients. We will stretch the skins ourselves and allow them the natural process of curing for two days. You will be able to take your hand-made drum home with you as a very special momento of our weekend together. Crystal digging. Next, we will spend both Saturday and Sunday in the crystal mines of Mt. Ida, shoulder to shoulder, allowing the gifts from the earth to surface for us. Mt. Ida was recently named by several great channels as one of the highest vibrational points on the earth at this time. We begin by digging crystals within the mounds of dirt brought up from the Earth. Then, we go into the mines to gently bring the crystals out to the light. Wire-wrapped Pendant. On Monday, you’ll have the opportunity to shop for a polished stone or crystal and learn to wire wrap it as a pendant so you can wear it under the full moon, if you choose. You may even choose to wrap a “found” crystal. Wire material for wrapping is included in the retreat. Polished stone or crystal is optional at your own expense. And create a mystical Power Wand for healing, protection, intuition and more. Drumming and Charging. Sunday evening, we will gather within a drum circle to experience the rhythms of our new drums as well as charge our crystal gifts under the stars by Lake Quachita, in the forest of Mt. Ida. Our drumming will wrap up our Rock’n Rhythms experience as we bring our vibration together uniting our energies of manifestation. *Breakfast, most lunches and dinners are included Thursday evening thru Monday morning. We may go our once or twice and that is on your own. Wire wrap materials, most power wand materials (excluding stones), some crystal digging equipment, transportation to activities, are all included. When you register we will provide you a list of things to bring. Drum Kit and drum beater are not included in price. Thurs., April 25 – 5:00 PM: Dinner together in the Mountain Harbor Resort. An evening with Adironnda & Company. We may even start on our Drum Beater. 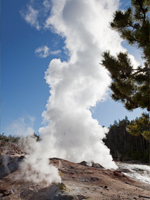 Fri., April 26 – Drum-making, relaxing, hiking, a full day, digging for crystals, Breakfast, Lunch and dinner provided. An evening of channeling with Adironnda and relaxing. Sat., April 27 – A full day, digging for crystals, Dinner is on your own. An evening of channeling with Adironnda and relaxing. Sun. April 28 – Shop for polished crystals, learn to wire wrap your crystal as a pendant or make a power wand. We may even have time for a cruise on Lake Quatchita. Dinner provided. 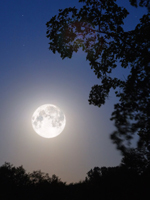 Full moon drumming. Mon. April 29 – Say goodbye and head back home. There is a great deal of shopping around Mt. Ida, Hot Springs for lots of Rocks, Stones, Crystals and more. Special Opportunity: Lodge with Marilyn and Joeaux (and Adironnda)! There’s room for 3-5* in our cottage. 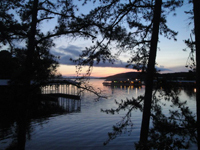 Mountain Harbor Resort & Spa is located 25 miles west of Hot Springs, AR on beautiful wilderness Lake Ouachita. Little Rock is the nearest airport, approximately 70 miles from Mountain Harbor Resort. If you fly, you can fly into Little Rock AR and rent a car. If several are flying in then we will try and match you all up to share rentals. Click here, for more specific travel information. Here’s a great little blog by a gentleman who created his drum from the same kit we will be using, click here! 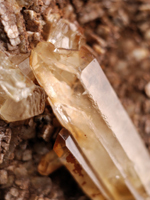 For specific information on crystal mines in Arkansas, click here! To read more on Arkansas and the thrill of the crystal dig, click here! For more details on the type of crystal found at Mt. Ida, click here! Cancellation Policy: Retreat must be paid in full due 60 days prior to arrival. If cancellation is necessary between 60 -30 days prior to arrival 1/2 payment will be refunded. If cancellation is necessary less than 30 days prior to event, we reserve the right to offer no refund unless your spot if filled with another participant. If cancel prior to 60 days from arrival all will be refunded except a $200 reservation fee. We know sometimes emergencies arrive, please contact us for cancellation arrangements.